If planetary scientists could do whatever they wished, they’d probably send a spacecraft to land on the floor of Valles Marineris. IF PLANETARY SCIENTISTS COULD DO WHATEVER THEY WISHED, they’d probably send a spacecraft to land on the floor of Valles Marineris, a gaping canyon that stretches 2,500 miles across the Martian surface, exposing the planet’s past in pancake-like layers of rock. But the twin NASA spacecraft due to land on Mars in January won’t be going there. Researchers might be just as happy to have robots roam Gale Crater, a saucer-like depression near the equator of Mars that may once have held a body of water shaped like Oregon’s Crater Lake. 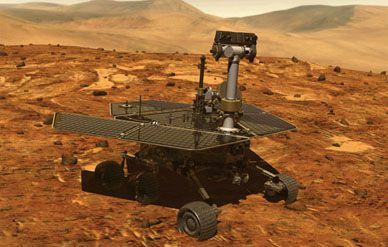 But the landers, with wheeled rovers larger and more capable than Mars Pathfinder’s Sojourner robot, which roamed the planet in 1997, won’t be going to Gale either. Hundreds of scientists and engineers spent close to three years sifting through more than 150 destinations for the Mars Exploration Rovers (MER) before they settled, with a sigh of relief, on two: another lake-like crater called Gusev, named for 19th century Russian astronomer Matwei Gusev, and a mineral-rich plain called Meridiani Planum. Never before had scientists looking for places to land on the Red Planet had so many options. Never had they known so much about each candidate site ahead of time. And never had the stakes for getting there seemed quite so high. Unlike Pathfinder, the $800 million MER is not a demonstration of new technology. This time the spacecraft’s job is to return information, particularly clues about whether life once existed on Mars. 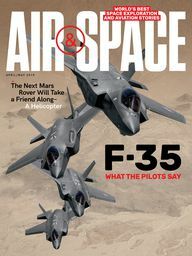 Researchers scrutinizing the planet’s surface for landing zones had to weigh the scientific interest of the site against the odds that winds, rocks, or some other hazard would knock the craft out of commission. 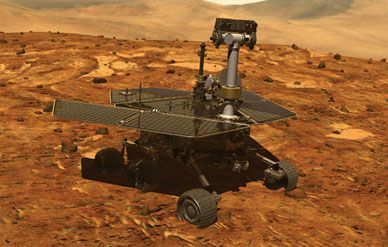 Two-thirds of all past attempts to reach Mars—including NASA’s 1992 Mars Observer, the 1998 Mars Climate Orbiter, and the 1999 Mars Polar Lander—have crashed or otherwise failed, and MER project managers are only too aware that another spacecraft loss could jeopardize NASA’s plans for Mars exploration. So in September 2000 the committee began laying the groundwork for an exhaustive series of reviews to choose destinations for the rovers, which will explore out to a radius of about three-quarters of a mile from their landing sites. “Everyone just wanted to tear into everything, pick everything apart,” says Golombek. Even though many researchers who joined the discussion originally championed other sites, almost everyone agreed in the end that Gusev and Meridiani are, on balance, the two best places to land. That doesn’t mean they are the most interesting scientifically, or that they pose the lowest risk to MER’s cocoon-like airbags, which will bounce as many as a dozen times to cushion the shock of landing. But in the calculus of risk and reward, they emerged the winners. Scientists did not have the whole of Mars to choose from. The need for solar power to keep the rover instruments running during the 90-day science mission limited the options to a narrow band around the planet’s equator, covering just 10 percent of the surface. Farther north or south, the sun would be too dim, and the instruments could be crippled by night temperatures dipping below –200 degrees Fahrenheit. High elevations were out. Otherwise the descent through the wispy carbon dioxide atmosphere would be too brief to allow the parachute to pop out, the airbags to inflate, and the retro-rockets to fire before the craft hit the ground. The terrain also had to be fairly flat. Slopes steeper than two degrees over about half a mile, or more than 15 degrees over about 30 feet, could send the airbag-enveloped landers rolling out of control. Despite these constraints, MER had a huge advantage over past Mars landers. Two spacecraft currently in Martian orbit—the 1996 Mars Global Surveyor and 2001 Mars Odyssey—had photographed potential landing zones in unprecedented detail. Mission designers had millions of close-up snapshots to work with, compared to fewer than 8,000 less-detailed pictures taken by NASA’s Mariner orbiters prior to Viking, the first successful Mars landings in 1976. Looking back on that mission, Tim Parker, a JPL planetary geologist who took a leading role in the MER site selection, says, “There was so much we didn’t know, there were probably some definite luck factors” in Viking’s success. Even with Pathfinder, “the ignorance we had was probably rather blissful,” Parker says. Since then, closer looks at the planet have revealed that the landing zone has potentially dangerous gullies and hillocks that mission planners didn’t know about at the time.